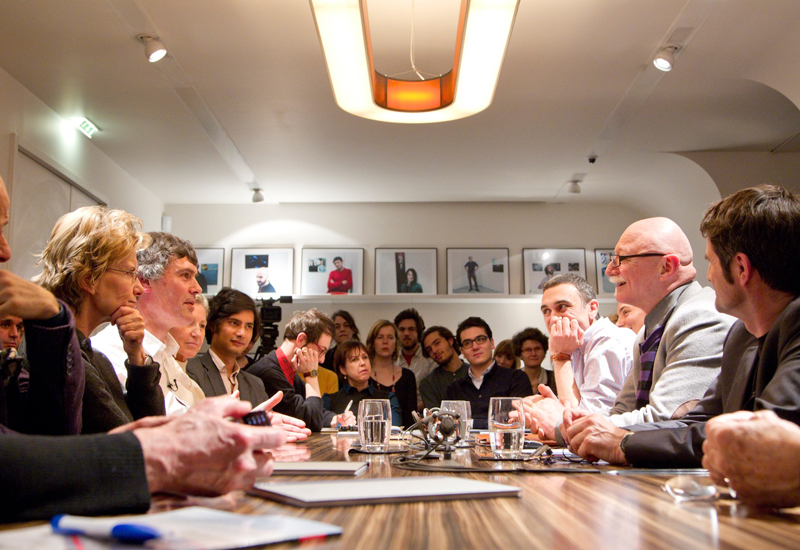 Conversation at Espace Vuitton with M.A Moulonguet, Paul Ardenne, Yann Dumoget, Ami Barak, Laurent Mulot. Photo D.R. 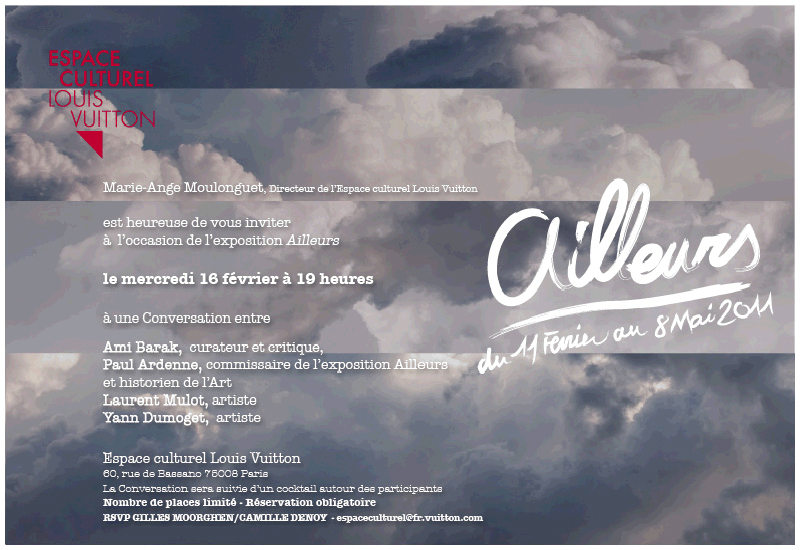 From 11 february to 8 may 2011 Espace Louis Vuitton, Paris, France. 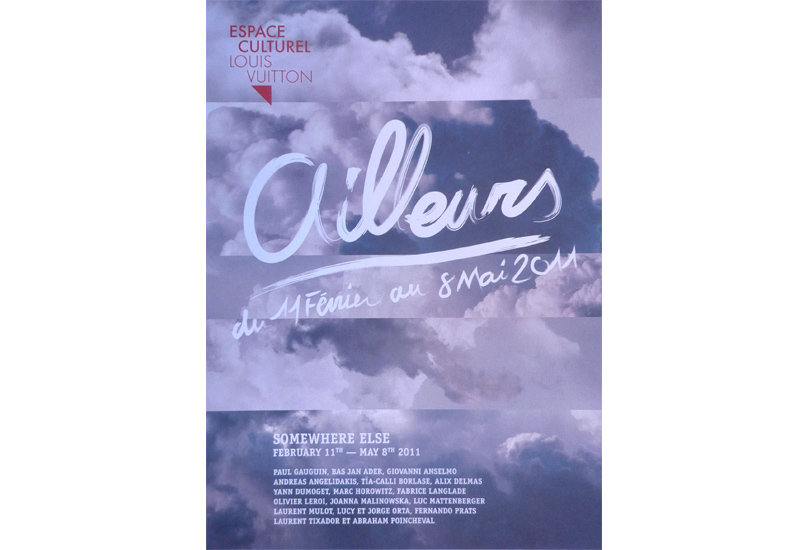 Eighteen expeditionist artists are coming together this year to create a unique artistic journey at the 14th Espace culturel Louis Vuitton exhibition titled ‘Somewhere Else’. Between February 11 and May 8, 2011, this endeavor by Louis Vuitton offers a new variation on the theme of travel. Over the years, there has been a growing interest among artists to give a whole new dimension to their creation. Some try to relocate their creation in order to define them separately, some work on work installations while some others produce their creations outside of its conventional environment. Such undertakings have, in fact, led to a new artistic movement which is primarily based on encounters with new spaces and other human beings. Curator Paul Ardenne, through this exhibition, brings together a collection of authentic art by some of the most famous expeditionist artists. This includes names like Paul Gauguin, Giovanni Anselmo, Tïa-Calli Borlase, Alix Delmas, Yann Dumoget, Joanna Malinowska, Luc Mattenberger, Laurent Mulot, Lucy + Jorge Orta, Fernando Prats, Laurent Tixador and Abraham Poincheval. ‘Somewhere Else’ will open symbolically with the tragic example of Bas Jan Ader, who set sail in 1975 to cross the Atlantic on an unsuitable boat, at the cost of his life. This will be followed by the iconic example of the Italian sculptor and painter, Giovanni Anselmo, who climbed Stromboli in an expression of contact with the infinite. In the exhibition, different geographical locations have been explored by the various artists. While Joanna Malinowska travels the farthest, in the hostile Arctic regions; Laurent Tixador and Abraham Poincheval try out an underground elsewhere during an unprecedented mobile troglodytic adventure. Yann Dumoget’s work, on the other hand, is driven by its need for interaction. Such endeavors focus on the need of an artist to leave a conventional space to create a masterpiece ‘Somewhere Else’.